First up, the whole point of the five jokers, the full card five point bonus and the away teams on missing ya tips was to keep Sam Griggs off the winner's podium!!! In 2013 Sam streeted the field so early the comp was all but over after half a dozen rounds. So in 2014 the Uglybustards Rules Committee consisting of Leigh Mathews and Kevin Bartlett brought in the "Sam Griggs Joker Ladder" as the main prize pool ladder. But it didn't take the 'bustard long to back up, winning his next crown in 2015 on that same ladder, and two years later he looks like backing up yet again! It's like trying to tag Gary Ablett Jnr with both arms tied behind ya back and ya bootlaces tied together FFS!!! Youse experienced Uglybustards, old campaigners & past champeenz Arnold Layne, The Boot, Rhino and Cowboy, youse have been around fer frckn years but I bet youse never seen anything like it! Even Griggsy, a past Champ & blood relative, in fact pretty sure he spawned Sam Griggs, well he cant keep up either!!! And recent champs Flopalot and Mik, left in the dust. So I'm askin youse all to dig deep. Walk down the hall of mirrors. Take a good look. Walk down twice if ya have to!! Go to Luna Park and look at the thin mirror, the fat mirror, the wobbly mirror! Extract that last centimetre & pull ya collective fingers out all youse Uglybustards, all of you! That's right. All of you! *(copyright Bomber Thompson)* and tip as hard as ya bloodywell can fer the rest of the season!!! Its not over yet - the full card bonus will come into play during finals and no doubt make a crooooshul difference!! So dont drop ya heads orrrrright! Its taken our new recruit, the tyro from down Geelong, Travinport, to show the way. What a find! Leading the standard season comp from stalwart Olles Jacyna with Sam Griggs bobbing up yet again in 3rd. BecCG's havin' a go keepin Sam at bay in the Margin Comp so he doesnt make it a clean bloody sweep. She's holdin him off by just the 9 pts at this stage, with Rod Carter 3rd and LittebUstard 4th (good work son). And then the real comp, the Sam Griggs Joker Ladder. 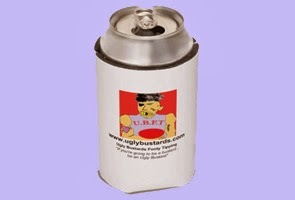 Remember we are playin for the coveted Uglybustards Guernsey!!! To wear this youse need to sacrifice 27 weeks of blood sweat & tears over your tips every frckn weekend!! Will Sam Griggs win another Uglybustards Guernsey in 2017? Out in front we have Andy but hes shot his bolt early with all jokers gawn. Yes Maxy bloody Gawn mate!!! PETER LEWIS is still in it with a joker left and 4 pts ahead of Sam, then BecCG 2 pts ahead & in the same boat. But wait, there's more. Yes its that bloody Sam Griggs again - and tyro Travinport. Tied in 4th just 6 pts off the lead and both with 2 jokers left. It's the double champ Vs the new recruit!! Hollywood couldnt have scripted it better and are enquiring about movie rights as I type this out on my one finger typewriter. Anthony Aiello has had a good run, Tommy, Mik and Zenben appear to have run out of options so may go the knuckle. Faint hopes remain with Griggsy and Rod Carter. Yes its been a tough season. The toughest in our 18 year history. I've cried. Yes and I'm not ashamed to admit it. Yes thats right youse bustards I've been brought to frckn tears in frustration as I've dropped from 1st to 32nd in the margin comp in 8 rounds....I even used to be a contender in the ladder comps. Now I'm a washed up old has-been. DON'T LET THAT BE YOU!!! I want to see all of you - yes that's right ALL OF YOU *(credit; Bomber Thompson)* down at the TAB studying the form every frkcn day in these final weeks!!! And maybe, just maybe, one day the coveted Uglybustards guernsey will be yours - AND YOU WILL HAVE EARNED IT!!!!! !